When it comes to executing a civil engineering project, one of the greatest challenges an organization is likely to face is the sheer amount of land that needs to be surveyed. Civil engineering and infrastructure projects tend to cover very large areas, and completing land surveys for these projects can be very time-consuming. As a result, the completion of such a project can be severely delayed. In order to make sure that their infrastructure projects proceed according to schedule, organizations need to be able to take advantage of the latest in land surveying technologies, which can help survey large areas in a short period of time. One example of such a technology is 3D laser scanning. In this post, we’ll discuss why surveyors are using 3D laser scanning in construction, particularly civil engineering projects, and talk about how you can learn to make the most of the benefits 3D laser scanning offers for your infrastructure projects. 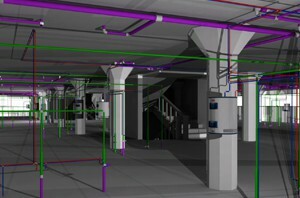 In order to use 3D laser scanning in construction, an organization would set up a series of scanners around the area than needs to be surveyed. The scanners would collect millions of points, which would bounce off the terrain or objects of interest, and then return to the scanner. The scanner would measure the flight path of the laser beam as it returns, and based on the path it takes, plot the coordinates for the surface that the laser bounced off of. By combining this information for thousands of different laser points, the scanners can assemble a data point cloud, which can be used to create a very detailed 3D model of the area that’s being surveyed. Since laser beams can cover long distances instantaneously, the size of an area to be scanned doesn’t increase the amount of time it takes to turn around the finished land survey. This is what makes the technology a particularly good choice for civil engineering projects which cover large distances. In addition to its inherent usefulness for new infrastructure projects, 3D laser scanning can also be very beneficial to organizations as they perform maintenance on their existing infrastructure. Over time, as infrastructure ages and structural integrity begins to falter, organizations must be vigilant to ensure that the infrastructure they’ve built in the past will continue to be useful for many years to come. However, the act of performing maintenance on infrastructure requires you to first know where the potential problem areas are. On large civil engineering projects, the very act of checking for potential problem areas can be a very time-consuming process, to the point where you might spend much more of your time looking for problems than you would actually addressing the problems. With 3D laser scanning, you can remove the need for manual problem analysis altogether, and significantly speed up the infrastructure maintenance process. Simply conduct a laser scan of a piece of infrastructure, then create a 3D model of it and use that to identify what maintenance work needs to be done to it. In order to make the most of 3D laser scanning in construction, you need to work with a surveying firm that has experience using the technology to successfully complete projects. That’s where Landpoint can help. Review one of our project examples to learn more about our capacities, or contact us today to get started applying 3D laser scanning to your infrastructure project.